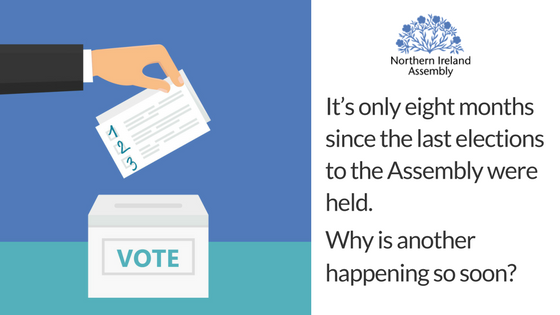 Assembly Round Up: It’s only eight months since the last elections to the Assembly were held. Why is another happening so soon? It’s only eight months since the last elections to the Assembly were held. Why is another happening so soon? The Secretary of State for Northern Ireland, James Brokenshire MP, announced that elections to the Northern Ireland Assembly will take place on Thursday 2 March 2017. The Secretary of State is required by law to call an election once every five years, or if either the First Minister or deputy First Minister resigns and does not re-nominate to fill the vacant position. There are two positions within the Executive Office, the First Minister and deputy First Minister. However, it is a jointly-held office and one Minister cannot be in post without the other. As set out in the Northern Ireland Act (1998), if either the First Minister or deputy First Minister resigns (and does not re-nominate within a seven day period), the remaining Minister also ceases to hold office. In this case, the deputy First Minister resigned at 5pm on Monday 9 January (and did not re-nominate), therefore the First Minister also ceased to hold office and both positions became vacant at 5pm on Monday 16 January, 2017. The law then required the Secretary of State to dissolve the Assembly and call for an election. The Assembly was dissolved at 00:01 on Thursday 26 January, 2017.